Please read the following statement. Remember – it’s YOUR Armory. Don’t let the Mayor’s personal agenda take it away from you. Get Involved! We have had enough of the Mayor and his cronies mortgaging our heritage and our future for the benefit of his political career. On October 10th we will gather at American Legion Post 8 at 112 North Avenue at 6 p.m. Once gathered we will form up and march, as a group shortly before 7 p.m. We will march up North Avenue to the steps of City Hall. From there we will enter the Council Chambers and educate Council Members on just what CITIZENS TO BE HEARD actually means. Bring your friends. Bring anything loud — horns, cowbells, trash can lids. October 10th. 6 p.m. Come, March. Be Heard. Citizen. Ever since becoming Mayor in 2006, Noam Bramson has claimed that development at Echo Bay was not economically viable so long as the New Rochelle Armory stood. Bramson orchestrated a cynical policy to intentionally neglect even the most basic maintenance of the building. Under his stewardship, such as it was, a multi-million public asset has been looted and pillaged — murals destroyed, military artifacts stolen, a gaping hole in the roof opened — and left open — to allow water to pour into the people’s building with each passing storm. Not content with simply neglecting the building, Bramson has been the loudest voice in the City demanding the absolute destruction of the Armory. In 2010, he conspired with New York State Assemblyman George Latimer in a cowardly attempt to sneak a bill through the state legislature late one Friday night that would have allowed Bramson to level the Armory the following week. At every step of the way, New Rochelle Veterans and the Save Our Armory group, volunteers all, have worked tirelessly for more than a decade to fight Mayor Bramson’s repeated attempts to dismantle and sweep away the Armory. The more the Mayor acted to destroy the building, the harder these New Rochelle heroes fought. The harder they fought the more bitter became the Mayor’s attacks — not just on the idea of saving the Armory but in personal attacks on the individuals involved. Where hundreds of New Rochelle residents came together to fight for a principal — saving a valuable public asset with a special meaning to the community — the Mayor made the fight about his own ego and his own personal political benefit — advancing a pet project at the behest of deep-pocketed political donors who lined his pockets for many thousands of dollars. With this history, it is not difficult to imagine the reaction of our Veterans and those that stood with them, the Save Our Armory Group and their supporters as they were forced to listen as Mayor Noam Bramson, pounding his fist on a table for emphasis, declare two weeks ago his unbridle enthusiasm for the result of “our” efforts to to save the New Rochelle Armory, crediting himself while cynically expressing his supposed appreciation for the work of the Veterans and Save Our Armory. An unscheduled, unexpected 5-2 party line vote, awarding development rights the Armory to his political donors and family friends so they can acquire the building at little or no cost and convert the building into a facility for the benefit of a for-profit entity — a gaggle of North End cronies who could not have found the Armory with a GPS system, a compass and a map until the Mayor offered it to them on silver platter. In selecting a company called Good Profit, the Mayor has embraced turning the Armory into an indoor farmer’s market. The Veterans have no problem with Good Profit opening a Farmers Market for locally grown organic food and a restaurant. We do have a problem with the Mayor handing over OUR armory to a for-profit private venture to convert a public property into a private use for the benefit of corporate shareholders at the expense of New Rochelle residents. We see no particular demand for yet another market to buy fruit and vegetables or dine out but if Good Profit does they are welcome to open for business — just not in this particular building. There are any number of places in New Rochelle that could house a farmer’s market; there is only one building with the historical significance of the New Rochelle Armory for many thousands of New Rochelle residents. Where we do see a need in New Rochelle is the area of performing arts. Our vision is a spectacular, state-of-the-art performing arts center to showcase New Rochelle, honor our veterans and bring world-class theater, music and the arts to New Rochelle. The New Rochelle Veterans, along with the Save the Armory and the New Rochelle Opera, have submitted a proposal for adaptive reuse of OUR Armory as acommunity space for the residents of New Rochelle in keeping with the deed of transfer under which the City originally required the Armory and the surrounding 3-acre property back in 1997. This 501-3c non-profit entity would develop and manage a badly needed, 35,000 square foot Performing Arts Center within the context of a community center both honoring and serving the post-service needs of veterans including those returning from Iraq and Afghanistan. The Veterans Center for the Performing Arts, a 500-seat, state-of-the-art theater, will serve as the official home of the New Rochelle Opera and any number of local arts groups. In addition to opera, the theater management will offer entertainment ranging from Broadway plays and musicals to musical concerts and a variety of performance showcase events. Complementing the theater will be space set aside for arts programs including studios for music, voice and dance lessons, actor training and smaller performance spaces. 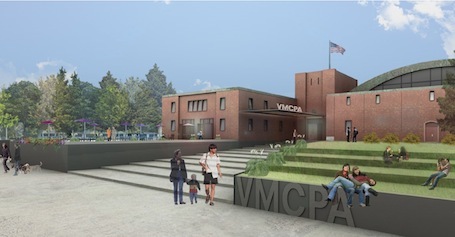 We proposed as a centerpiece, Veterans Hall which would honor our New Rochelle Veteran KIA & 9/11 Victims, a memorial to those from New Rochelle we lost in combat including the global war on terror. The space would house a museum and gallery space to showcase New Rochelle artists going back to Fredric Remington up to Norman Rockwell and through to the present day. The space would display historical items and artifacts celebrating New Rochelle’s Military History going back to the Revolutionary War up through the Civil War, when Fort Slocum on David’s Island served as a prisoner-of-war camp, to 20th century conflicts when the Armory served as a staging area for troops going off to war, to 9/11 when the armory served as a distribution point for supplies reaching first responders at Ground Zero. We incorporated into our design a 200-seat restaurant including an indoor dining area and a rooftop deck overlooking the Long Island Sound both intended to be self-sustaining in their own right but to also serve as a supper club for our main venue. Our vision is a public facility created by and for New Rochelle residents to gather and celebrate their traditions, histories, military service and world-class artists and performers — exactly in keeping with the terms of the deed to the Armory from New York State. The RFP was first discussed in a Committee of the Whole Meeting on distributed on April 10, 2012. The most recent MOU with Forest City for Echo Bay, dated May 14, 2012 required the city to issue a RFP for the armory within 30 days of May 14. No official vote but a final draft of the RFP was submitted to the City Council in May and officially announced in May 2012. The official tour of the Armory took place on June 13th and presentations to City Council were scheduled for August 7th giving us just 55 days to get our team into the building, make an evaluation, run the numbers, sketch designs and prepare a formal presentation. Despite claims to the contrary by the Mayor and his allies, our group submitted our response to the RFP on time, we presented to City Council on time and answered all questions we received after the presentation on time. We did not miss a single deadline. We objected to the Mayor, on very short notice, scheduling two of the most important dates in August. Key members of our team had long-planned family vacations and personal commitments. We discussed with New Rochelle Development Commissioner Michael Freimuth, at the time, and were told that he recognized that not a lot was happening in August, that there would not be a vote until October and there would be plenty of time for our full team to present to the City Council. We never got that chance – our subsequent request to make our full presentation with our partners in September, after Labor Day, was denied. Then the vote was moved up from October to September. Our partners are well-regarded professionals, SHOP Architects and Shawmut Design and Construction. Shawmut Design and Construction is a leading construction management firm with offices in Boston, New York, Providence, Las Vegas, and New Haven. They have completed over 600 projects ranging from museums to sports venues to casinos to churches. Their client range includes Four Seasons Hotels, Harvard University, Wynn Resort & Casino, Tiffany & Co. and many more. Last Tuesday we reserved the City Council Chambers at City Hall and invited all members of Council to here our presentation, led by Todd Sigaty of SHOP Architects. It was a spectacular presentation. Unfortunately, the Mayor and his allies on Council did not see it — under the direction of the Mayor they boycotted the presentation as a group, some offering dubious excuses for not coming to the presentation. The Council Members who did attend, Lou Trangucci and Albert Tarantino, admitted to be skeptical but came away impressed with the creativity of the design, the strength of the two partners and the overall concept for a viable performing arts center in New Rochelle. There was good reason for the Mayor to be afraid of the public and council seeing the presentation — it was that strong. The night next, during the discussion of the two plans, some council members cited the “professionalism” of the Good Profit team having not allowed our team to present or even bothering to come by City Hall the night before to meet the impressive team from SHOP and Shawmut, both of whom have worked extensively with Echo Bay developer Forest City/Ratner. Some council members cited the lack of funding commitments for our team while admitting that the other team had no funding commitments either. Of course, neither team can line up vendors and financing without first having the rights to develop the property under an MOU. Without exclusive rights granted under a Memorandum of Understanding, there are certain obvious limitations in reaching agreements with potential tenants, vendors and lenders. As is always the case with any development, the response to an RFP is largely a presentation of a conceptual plan with some very preliminary estimates on financing and specific uses and designs within the broader concept. Anyone who has followed the ever-evolving concepts presented by Forest City/Ratner for Echo Bay will understand how much these initial concepts evolve over time. The Mayor and others made repeated claims that it was not fair to the other team to allow us to give our complete presentation, with our design and construction partners, and even claimed it might illegal to do so. The City’s own attorney stated that this was not true and there was no legal reason not to allow us to give our presentation. Without a hint of irony, the same Mayor who has twisted himself into a pretzel, bending over backwards to accommodate developers like Cappelli and Forest City/Ratner, was suddenly a stickler for process and immovable deadlines. Can anyone even count how many MOU extensions were granted for Echo Bay and Le Count Square? Does anyone remember the State Comptroller report that cited the New Rochelle IDA for failing to do a single cost/benefit analysis for any development project in the last 10 years? The Mayor has turned a blind-eye to developers who miss deadlines, fail in their commitments, wheedle and whine for do-overs and all of a sudden, after a decade working to save the Armory the Veterans, he can’t spare even an hour of the Council’s time? All of this while pontificating about being “fair” to his cronies at Good Profit. We have learned that discussions between Good Profit and City officials began months beforethe RFP was even discussed by City Council. We believe the Good Profit was provided information and provided special access to the building for many months before the RFP was drafted. The effect was to give the Mayor and his pals at Good Profit a six month running start and then set a narrow time frame designed to advantage Good Profit at our expense. There was a “public visit” of the Armory as part of the RFP. That was the only access provided to our team. Good Profit was granted repeated, exclusive access. The Mayor’s solicitousness of Good Profit is, of course, understandable when you realize that people on the Good Profit team are the Mayor’s personal friends and long-time contributors to his political campaigns. Life is not always fair and if we lose in a fair fight we realize we have to take our lumps and move on. This was not, however, a fair fight — this was a rigged game from start to finish as has become increasingly apparent as the personal connections between the Mayor and the Good Profit team come into view. On the day the Mayor bum-rushed a vote the City Council to eliminate our bid from future consideration, the Development Commissioner, Michael Freimuth resigned. Based on numerous accounts, he had grown fed up with the Mayor’s amateurish meddling in his area of expertise. During the meeting, Mayor Bramson called on Freimuth to make a recommendation to Council without disclosing what he knew but the Council did not — that Freimuth had already resigned. The Veterans, the Save Our Armory Group and our supports have been fighting for more than 10 years to protect and save the Armory from Noam Bramson, who has been at the vanguard of the effort to destroy our building. We are prepared to fight 10 more years and 10 more after that if that what it takes to protect our building — really our heritage — from the political maneuverings of a warped, frustrated man who as always treated New Rochelle as a stepping stone to future political ambition. The madness in our City needs to end. Please, come to the American Legion on Wednesday October 10th (not Tuesday as is usually the case) at 6 p.m. We will be making signs and hearing from our Veterans and Save Our Armory members on what’s at stake — nothing less than soul of our City. Tell your friends, send out emails, put up notices in windows, call in to WVOX. Do your part. Spread the word. Be there. Save the Date to Save the Armory.